SOUTH KOREA: Doosan Heavy Industries and Construction (DHIC) will provide operations and maintenance (O&M) services for the country's largest offshore wind farm. The 15-year O&M contract follows a turbine supply deal the manufacturer signed as part of a consortium with Hyundai Construction and Engineering in 2015. It agreed to supply 3MW turbines, designed in-house, for the first 60MW phase of Korea Offshore Wind Power’s Southwest demonstration wind farm, the company stated. 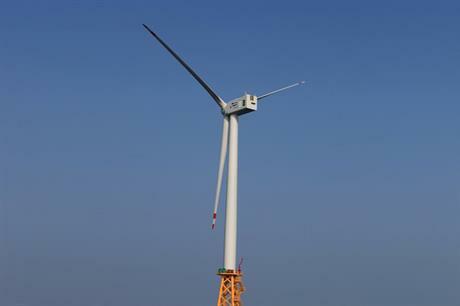 Construction of the 20-turbine, 60MW site, which is to be located off the coast of North Jeolla province in the south-west of the country, is scheduled to be completed by the end of 2019. As well as providing the wind farm’s 20 turbines, DHIC will also be responsible for guaranteeing their operation rate and providing routine maintenance services. Southwest is due to be South Korea’s largest offshore wind farm, according to Windpower Intelligence, the research and data division of Windpower Monthly. DHIC, along with South Korean engineering company Posco ICT, had developed the country’s largest operational offshore project — the 30MW Tamra site. In June, DHIC was selected as the main contractor for an 8MW offshore turbine for a project being developed by the Korea Institute of Energy Technology Evaluation and Planning. South Korea’s Ministry of Trade, Industry and Energy has set a target of 58.5GW of installed renewable energy capacity by 2030, with the growth "mainly coming from wind and solar". It is unclear how much of this would be from wind. The country currently has 825MW of installed capacity, according to Windpower Intelligence.